When it comes to food, we often leave authenticity out of it. In a town where the idea of the perfect pizza is stretched into a lengthy debate between thin or thick crust and Italian- or American-style, let’s not forget the strong opinions people hold on what toppings are considered appropriate, gourmet or, well, pineapple. When Kytaly opened its doors earlier this autumn, serving Franco Pepe’s world top-ranking pizzas, we couldn’t wonder how his pies would fare on this side of the world. The no-reservations restaurant takes up the space where Japanese izakaya Koko used to be, accessed via an ancient lift of an old commercial building on Wyndham Street. The brightly lit signage on the narrow hallway leads guests into an elongated corridor. It wouldn’t be appropriate to call it a room, as booths lining the indoor area will seat four max, while the other tables are snug and spill onto the terrace. Lighting was dim but adequate. At dinner time the small restaurant comes alive where crowds share the restaurant’s signature pizzas over cool cocktails, prepared at the bar hidden on the side of the space. The best table, we found, was on the far end next to the kitchen, offering a full view of pizzas being prepared and benefiting from swift delivery. The high table comfortably seats six, and is often shared among smaller parties. Kytaly’s menu is a short read. The antipasti section offers a humble selection of salads. We opted for the Capri, where buffalo mozzarella tops cherry tomatoes and dressed with dollops of basil cream and olive oil. The mozzarella yields softly, as its creamy texture contrasts with the meaty tomatoes, while the basil adds a nice, herbaceous touch to the refreshing first course, which with its small size should suffice for a dinner for two. A range of 19 pizza varieties are on offer, from classics to creative ones. We started with the one that is ranked number one in the world, the Margherita Sbagliata, where buffalo mozzarella tops the made-to-order pizza base, followed by squiggly pipings of Riccio tomato sauce and green dots of basil reduction and a generous drizzle of extra virgin olive oil. It is worth noting that the pizzas are baked on its own before adding toppings, in a similar fashion like blind-baking in pastry making. The toppings are quickly added seconds after each pizza comes out of the oven. The residual heat melts the cheese and warms the topping. The crust is light and refreshing, with a soft and almost gelatinous bite to it but not the heavy, bloated feeling that fast-food pizzas often bring. The abundant moisture from the mozzarella keeps the crust rather soft, making it easier to be enjoyed with knife and fork, although a skillful hand with plenty of napkins are just as good. We also ordered the Sole Nel Piatto, where buffalo mozzarella, Caiazzo black olives, Cetera anchovies and a mélange of herbs top the beautifully hand-crafted crust. 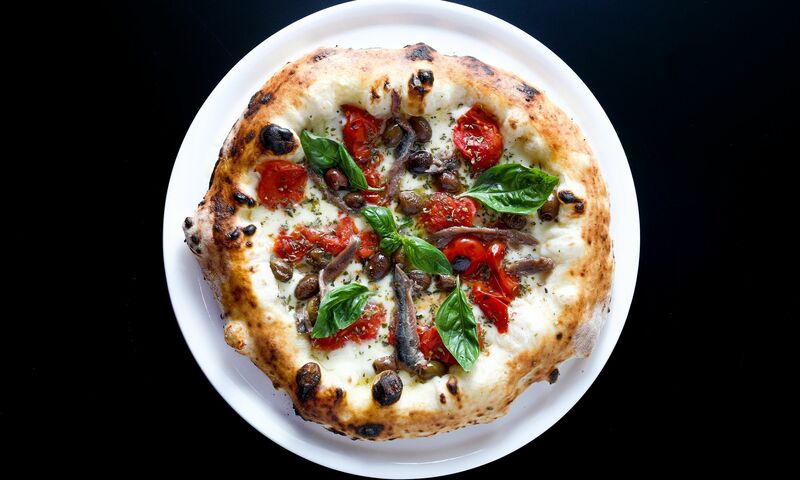 The herbs give the flavours a lift, although the toasty aroma of seared gluten-rich dough builds up the canvas that enriches the briny black olives and umami-rich salt-cured anchovies shining through in each irresistible bite. While pizzas are excellent, the three desserts on offer are different variations of tiramisu. A classic one sees savoiardi, or sponge ladyfingers layered in pillows of mascarpone cream. Our Nutella version replaces the original with a hazelnut cream and topped with a dollop of the famed chocolate hazelnut spread. While the pairing of chocolate and hazelnuts are ethereal in Italian desserts, the sponge and cream are both stodgy, and overly sweet. Kytaly offers a wide range of wines by the glass with a humble selection from various regions of Italy. Cocktails are beautifully crafted, especially those made with Campari, created at Hong Kong’s first Campari bar within the establishment. The Negroni Sbagliato blends vermouth and Campari with Prosecco. A very chilled cocktail that doubles as aperitif for pizzas served throughout our visit. Limoncino mixes vodka with limoncello, while tonic and lemon zest brings a fresh zing to the refreshing concoction. The three-person kitchen team turns out pizza every few minutes at Kytaly, but the restaurant floor is extremely short-staffed and disorganized. The hostess who greeted us at the door also occasionally helped refilling our water, while hot, ready-to-serve pizzas were left unattended on the pass, rapidly cooling off. Orders were rarely missed, but service was certainly messy and staff needed frequent reminding, although they were well-versed with knowledge about the restaurant’s pizza and calzone offerings. Kytaly hits all the right notes on its food offerings, as pizzas are masterfully crafted with high consistency. Its service, however, is substandard even for a restaurant aiming for casual dining. It is worth the visit, especially early on in the evening for the first-round seating to avoid extended waiting time. A meal for two with one cocktail amounts to HK$1,000.